If you have dined at a fine restaurant in the past year or so, you may have encountered the idea of sous vide ("soo veed") cooking for meat. The general idea is to slow cook the meat in a hot water bath that uniformly brings the meat up to the desired temperature. It does all the same things as cooking meat in more conventional ways except browning. Supposedly the meat comes out more flavorful and tender. Being self-employed, I have not been dining in fine restaurants for the last couple of years. And a boné fide sous vide cooker that keeps the water circulating at a precise temperature runs $300-500. Too rich for my blood. Enter the DIY mindset. Articles on this topic that I read suggested buying a cheaper cut of meat. It seems that the more expensive steaks are cut for tenderness rather than flavor, so less expensive cuts like hanger, arm, or flatiron which are tougher but more flavorful were desired. I like that. My local grocery only had arm cut so that is what I bought. Some reading about the "cooker" pointed at a simpler solution. A picnic cooler is nothing more/less than an insulated box. If it is effective at keeping things cold, then it should be as effective at keeping things hot. Off to the thrift store! 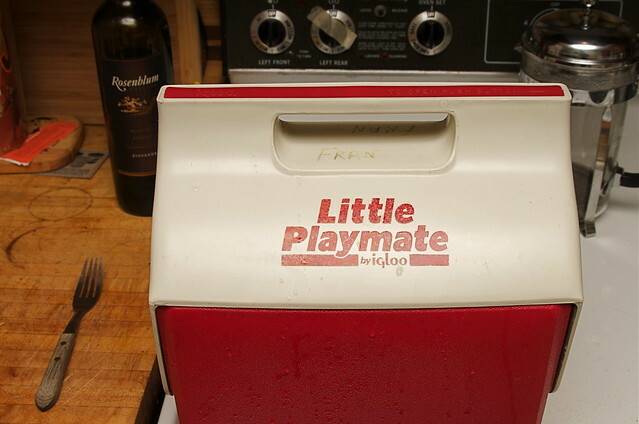 'Fran' had donated her lunch box cooler to the local Salvation Army store. I bought it for $2.09 and scrubbed and bleached it. Cooking meat doesn't require a high temperature. For rare, it needs to come up over 120 degrees. Medium-rare - my preference - is 130. My tap water tested out at 125 degrees (F) so it was nearly hot enough to do the cooking job. I brought a kettle of water to a boil to bump the tap water temperature above 130. In the meantime I individually bagged each steak. 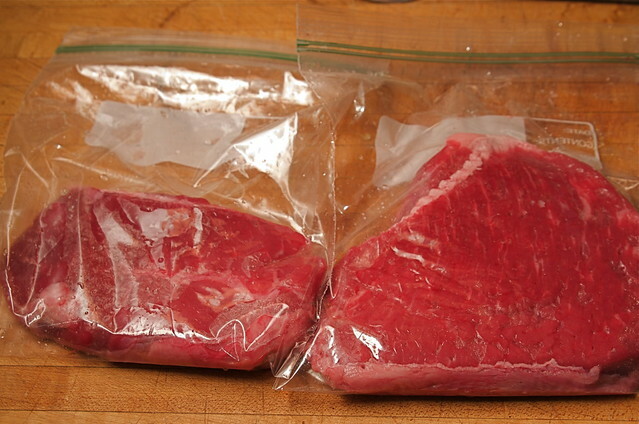 The real method is to vacuum seal the meat, but I made do with a zip seal bag. I read somewhere that 'Ziploc' brand is a smart choice because the plastic did not contain/release BPAs. I used what I had on hand. If I become a devotee of the process, I will buy Ziploc bags. I dunked the bag in the hot water before sealing it because it softened the plastic and let me get closer to vacuum sealed. The time to cook meat this way is much longer than grilling or broiling. What I read led me to believe that a minimum cook time was 45 minutes to bring chilled steak to a consistent 130 degrees. I brought the water in the cooler to 125 from the tap, then used the boiling water from the kettle to bring the temp to about 135 figuring that it would slowly drop over the cook time. And it did. Quickly. We keep our house at 64 degrees (F) this time of year, and so when I checked after 15 minutes the water had cooled to 125. I added more boiling water. I had to add water three times over the cooking time. A better cooler or perhaps an insulated wrap would make it more effective. 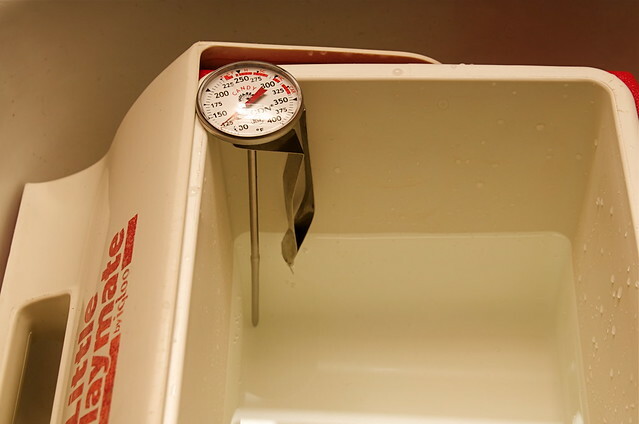 There is no possibility of overcooking the meat using this sous vide method as the meat cannot come above the water temperature. Longer cook times (a few hours) are apparently desirable as the meat gets more tender. I have things to do, so I did not fuss with the cooking for hours. I left the steaks in for about an hour, then prepared my side dish and salad. I did a quick check with Reena about 'serve as is' or do a quick sear when the meat was ready to be served. Color of the meat is still reddish because there is no high temperature to brown or char the surface. It looks ... not right. I opted to do a fast, very hot sear in a cast iron skillet with an oil suitable for high heat (not olive). 15-30 seconds per side was all it took to give the meat a more normal appearance (and texture). I have to say the meat tasted excellent. It was very moist (only 4% moisture is lost this way at this temperature) and mostly tender. This cut of meat had some very tough gristle running through one edge that had to be cut away while we ate, but everything else was superb. I will do it again, and add some aromatics to the bag to enhance the meat while it cooks. Possibilities include salt, pepper, garlic, or perhaps a herb medley such as Penzey's Bonnes Herbes 'Parisian'. I got so interested in eating that I never took the final photo! Labels: cooking steak meat "sous vide"
Thermodynamics says that if you start with the water at 130 degrees, you're gonna have to keep adding more hot water, even if you're cooler is perfectly insulated (no heat lost to your house). The way the water heats the steak is by energy flowing from the water to the steak. So in order for your steak to get warm, the water it's in HAS to cool down. 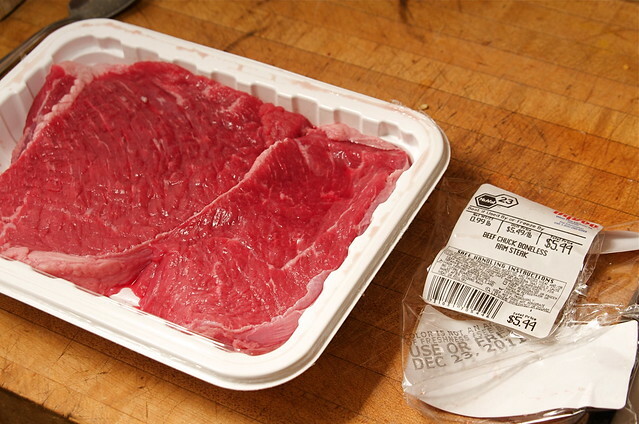 If not heat leaves the water, no heat enters the steak. Hence, the best way to do this is probably to plan to add boiling water at semi-regular intervals to bump the temperature up.